CHICAGO — The Dump Dobson coalition, a partnership of local and national gay, lesbian bisexual and transgender (GLBT) organizations, held a press conference to denounce the Museum of Broadcast Communications (MBC) for its plan to honor James Dobson in its Radio Hall of Fame. The awards ceremony is planned for Nov. 8., and the Dump Dobson Coalition is strongly urging MBC Founder, Bruce DuMont, to rescind the award or face a protest outside of its annual dinner. 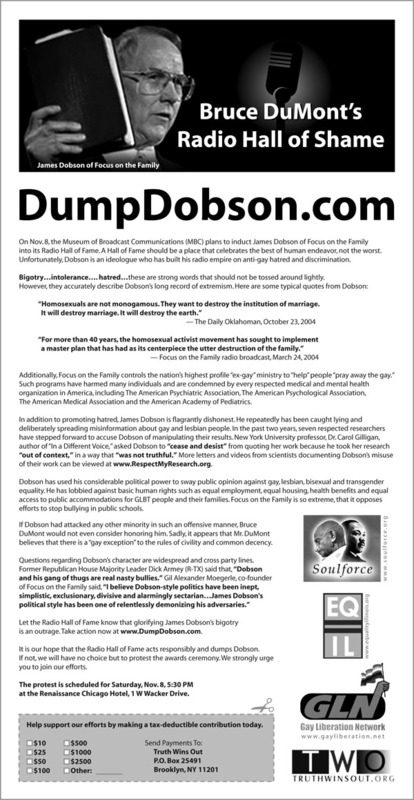 The Coalition has launched a website, DumpDobson.com and debuted its ad campaign with a full-page in the Chicago Tribune today. This will be followed by signature ads in the LGBT media that urge people to join the coalition’ efforts. The Dump Dobson Coalition is headed by the The Gay Liberation Network and Truth Wins Out and has so far been joined by Equality Illinois, SoulForce and the National Youth Advocacy Coalition. The Museum of Broadcast Communications opened up its Radio Hall of Fame balloting to allow people on the Internet to vote. James Dobson used his Focus on the Family show, which runs on 3,000 radio stations, to essentially stuff the ballot box. As a result, the Radio Hall of Fame is now honoring an anti-gay bigot who has built his radio empire on the backs of GLBT people. Honoring this ideologue is especially troubling during an economic downturn, which allows people like Dobson to scapegoat and promote discrimination. Dobson once said that allowing gay people to marry will “end the earth.” Seven scientists have accused him of distorting their work to support his anti-gay teachings. Letters and videos of these researchers can be found at www.RespectMyResearch.org. The Dump Dobson coalition was formed to educate people about the danger of honoring Dobson and to urge the MBC to take prudent and responsible action.